In his latest Moc, I Scream Clone shows us the power of nature. The beautiful island, inhabited by many islanders is doomed to die! Why? Because of the huge volcanic eruption ... The cottages alongside the many other details, like birds, palm trees and animals, are beautifully designed. In addition, it is rather rare to see so many islanders in one bunch. 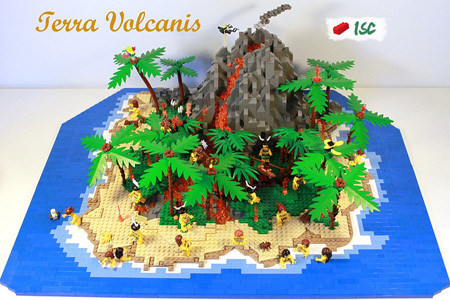 So, you see, it's absolutely worthwhile to stop by the Forum and visit Terra Volcanis by I Scream Clone. Categories: Islander. Both comments and pings are currently closed.